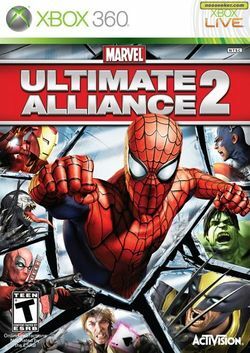 Marvel Ultimate Alliance 2 (previously known as Marvel Ultimate Alliance 2: Fusion) is the sequel to the 2006 action role-playing video game Marvel: Ultimate Alliance. The game was jointly developed by Vicarious Visions (PlayStation 3 and Xbox 360), n-Space (PlayStation 2, DS, and Wii) and Savage Entertainment (PSP), and was published by Activision. The game features characters from the Marvel Comics universe and will feature elements of the Civil War storyline. Marvel Ultimate Alliance 2 follows the same gameplay as its predecessor. The game allows players to choose four characters to play through the game. Players have the ability to level up characters and earn new abilities and powers. Vicarious Visions have made changes in the game and camera controls for greater fluidity during gameplay. The power combo system has been improved as two combined powers will yield a new attack, known as a "fusion". This page was last edited on 28 July 2016, at 16:47.